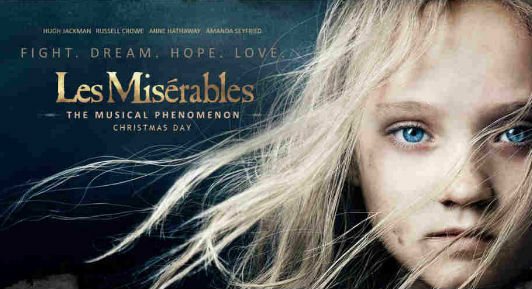 I went to see the film ‘Les Miserables’ last week and it has had a profound effect on me, which I want to share with you. Although it is billed as a love story and a comment on poverty and revolutionary politics in the period following the French Revolution, it is primarily a story of redemption. In one of the early scenes we are left breathless by the sheer grace and forgiveness of a Bishop. He forgives the main character, Jean Valjean, and tells him to choose to live his life differently. This reminded me of the story of Jesus and the Woman taken in adultery. When her accusers drift away, Jesus does not accuse her of her sin, but he forgives her and tells her to ‘sin no more’. The Bishop is like Jesus, in not only does he forgive, but he gives Jean Valjean the means to live a new life. From this moment, Jean Valjean is a completely changed man, and he decides to follow the way of truth and to help the unfortunate. He soon has a crisis to face, when it looks like somebody else is to be condemned to imprisonment, as they have been mistaken for him. This is a real spiritual crisis, as he is tempted to let the other man take the punishment for him, as he knows if he owns up, he can no longer give employment to many people and carry on the good works he is doing. Because of the example of the Bishop, Valjean can live a life of sacrificing himself for others. He personifies Grace, whereas Jalvert, the policeman who hates Valjean, personifies Law. In the film we see clearly that Law has its place, but Grace comes from a higher Lawgiver, as it is from God Himself. Grace will triumph in the end. As this film is receiving so much publicity at the moment, and thousands are flocking to see it, this is a good time to share with others these profound truths that God is a God of Mercy and of Grace, and that it is possible to leave behind your old life, and begin anew. A good few years ago, i went to London to see the stage play,did not want to go,but to keep the wife happy i went,i am glad i did, what an emotional and moving experiance it was,one not to miss. "Mercy triumphs over judgement!" James 2v13. It's just a shame the policeman felt he had to die.